I’ve always been a big fan of time-travel films, which can introduce mind-bending paradoxes and charming “fish out of water” stories. When executed properly, they can provide lots of surprises and great suspense because the usual boundaries are gone. I’ve already seen a lot of the classics, so this gives me a chance to check out some lesser-known gems. A perfect example is my first choice, 2006’s The Girl Who Leapt Through Time, based on the popular 1967 novel from Yasutaka Tsutsui. This anime film was a big hit in Japan but is not as well-known overseas. Makoto (Riisa Naka) is your typical high school senior facing everyday problems like pop quizzes, awkward crushes, and squabbling with her sister over pudding. By chance, she acquires the power to travel back in time by leaping from tall structures. The jumps are pretty brief, but they could fix small problems like oversleeping. They also might save her life from a bike accident. Unfortunately, making these changes creates other unforeseen problems for Makoto, and her life starts spinning out of control. Traveling back in time is simple but does require a leap of faith from Makoto. She starts jumping off small hills, out windows, and off the roofs of buildings to go back. The leaps are successful, but they generally send Makoto crashing into walls, posts, and other structures. The short jumps don’t always give her enough time to fix the situation and can lead to repeated attempts to solve a problem. Predictably, these multiple tries can have bad consequences. Other characters respond differently based on how Makoto acts, so there’s no easy way to fix a tough situation. Unlike many high-school movies, the characters in this movie are actually fairly likable. Makoto spends most of her time playing baseball with her best friends Chiaki (Takuya Ishida) and Kousuke (Mitsutaka Itakura). The trio has a great laid-back relationship that makes us care about their lives. 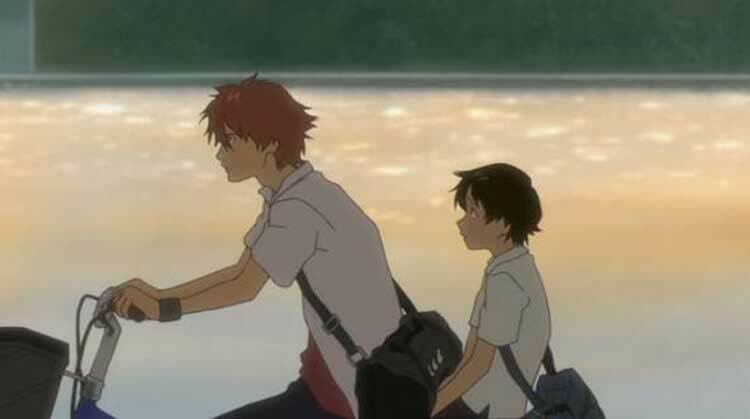 When an unfortunate series of events puts Kousuke and his new girlfriend on the bike heading for the same accident, it’s a possibly tragic and moving moment. Makoto and Chiaki might have feelings for each other, but it’s handled in the bumbling way that many teens handle these situations. We barely see Makoto’s parents, and their brief appearances typically revolve around eating dinner. This fits with the fast-paced nature of high-school life, where parents just sit by in confusion as the kids buzz around the house. 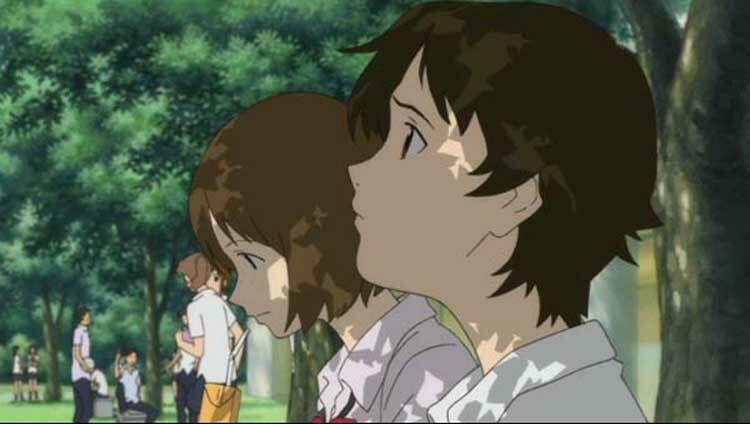 The Girl Who Leapt Through Time is a gorgeous animated movie that provides attractive shots of everyday places like the schoolyard and the baseball fields. Some of the best scenes don’t involve the time travel and just provide beautiful footage. This visual energy also appears during the jumping scenes, particularly Makoto’s first leaping experience. She journeys through a colorful, inexplicable world of blurry figures and time images that would look even better on the big screen. Another interesting character is her Aunt Kazuko (Sachie Hara), who knows about time leaping but holds back from saying too much. She hints at a similar experience in her own high school days, but her statements remain mysterious. The time periods where Makoto travels are very close to the present and repeat earlier moments. The characters’ reactions are usually believable each time when Makoto acts differently. The bike accident’s repeating of the same elements (a rude woman, toy soldiers, the approaching train) raises the tension because we know how the events will happen once again. Director Mamoru Hosoda keeps the story grounded and never goes too far over the top with the leap-induced changes. For the most part, the logic behind the repeated time periods makes sense because there aren’t multiple Makotos running around at the same time. However, that fact also leads to confusion about what actually constitutes a leap through time. My assumption is that her consciousness shifts back from the present version back to a past version of herself. This nullifies everything that’s happened before, and her life restarts at that point. It’s similar to going back to the beginning of the level in a video game. Everyone you meet will act the same, but you’re armed with that knowledge at the start. Unfortunately, there’s no simple way for Makoto to bypass any obstacles. A different approach could actually lead to an even worse result. 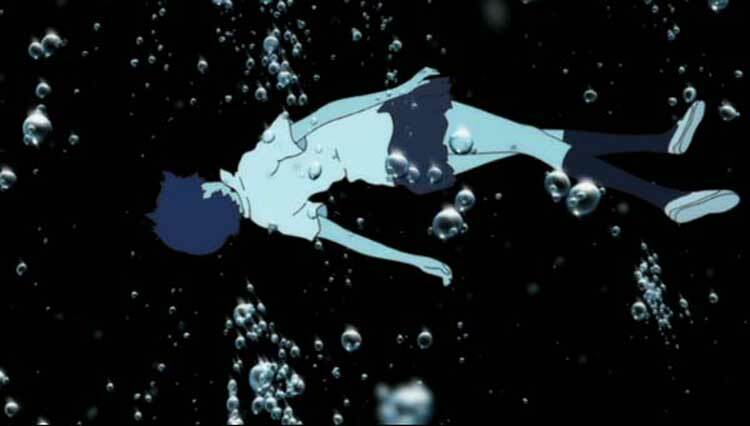 The Girl Who Leapt Through Time deals effectively with teen angst, romance, and the pratfalls of time travel. The only downside falls with the characters themselves, who are concerned with pretty basic issues. One of Makoto’s greatest victories is getting the chance to eat the pudding before her sister takes it. Life and death comes into play a few times, but it’s not the primary issue facing the characters. This isn’t a flaw in the movie, which is still highly engaging from the start. However, it does keep it from becoming a genre classic. I'm a fan of time-travelling and paradoxes in movies, so I approve of this theme! Looking forward to what will come next. I tend to not pay too much attention to logics. If you start thinking too much, the movies tend to fall apart a little. Why destroy the fun? Jessica, you make a good point about looking at the logic in time-travel movies. I'm rarely going to hate a movie because of a paradox. However, it is fun to explore how the system works in these movies. This is especially the case with next week's choice, Source Code. Thanks for the comment! Oohh, a time travel movie. I'm a big fan of those and love to see more reviews of these type of movies. Have you seen Timecrimes? If not I highly recommend it. Nostra, I have seen Timecrimes, and it's so great. Once I saw the way it was going, I wanted to yell at the guy to stop pushing forward to the inevitable end. Great suspense film. Sounds like an intriguing flick. Always been a huge fan of time-traveling fictions so I might give it a shot. i almost rented this once...i will have to ACTUALLY rent it next time (or time travel back in time and tell myself to do it...whatever happens first). Harvey, if you see a strange device on the floor, you never know - it might give the chance to travel back in time. Or you can just rent it, though that's less fun.